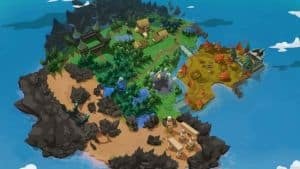 Battlerite Royale Map Revealed | Nerd Much? Stunlock Studios announced earlier this month that they would be adapting Battlerite to include a battle royale mode. Known as Battlerite Royale, we now have a first look as to the map Stunlock is shipping us off to in July. Our Battlerite Royale playground will be known as Talon Island. And the developers are doing their best to ensure this isn’t some generic battlefield. They’ve hired renowned lore writer Christopher Harrow to flesh out Battlerite’s universe and incorporate Talon Island into the mix. Talon Island is 30 times larger than the game’s standard arena mode map. It’s been segmented into several areas, including the town of Anvilfall, the Glimmering Woods, the Starlight Oasis, and the Ancient Tomb. The art director displayed concept art for some of these unique locations within Battlerite Royale. Amongst them is an ancient tomb players can explore. A sandblasted arid wasteland to the south. An abandoned fishing village along the coast. And numerous bridges that have been constructed across Talon Island to enable easy access to and from its various locations. With the showcasing of Talon Island, we also received a release window for Battlerite Royale. Stunlock states that they plan to have the mode available on Steam in July. Hopefully we’ll get a few more teases along the way to help alleviate the wait.